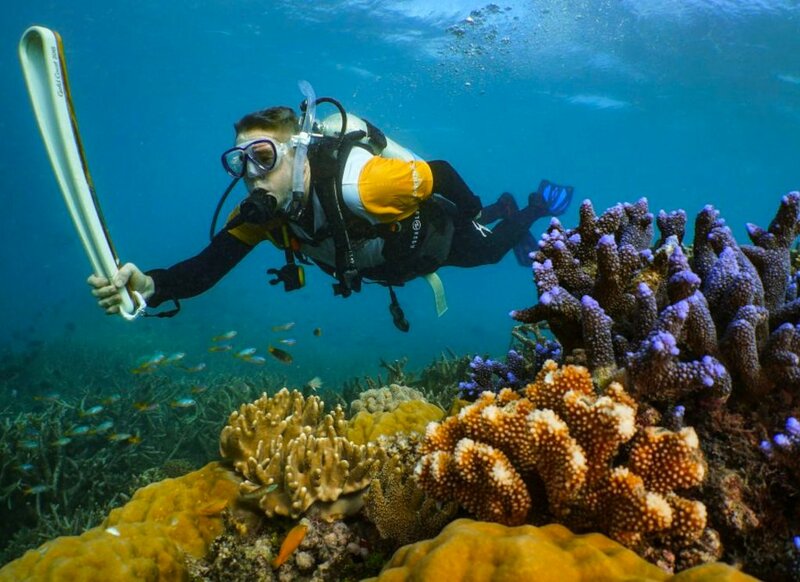 Queen's Baton Relay goes underwater for the first time in the Great Barrier Reef! Quicksilver Group Managing Director Tony Baker had the honour of diving the Great Barrier Reef with the Queen’s Baton as part of the XXI Commonwealth Games Queen's Baton Relay. Tony said, "It was a huge privilege to be part of the relay and especially to take the baton underwater on the Great Barrier Reef for the first time." An important theme of the Gold Coast Commonwealth Games is sustainability around the world so it was fitting that the symbol of the Games visited our World Heritage listed icon. The baton carries the message from Her Majesty Queen Elizabeth II calling the Commonwealth’s athletes to come together in peaceful and friendly competition which will be read by Prince Charles at the opening ceremony. The Queen’s Baton Relay (QBR) began at Buckingham Palace on Commonwealth Day on 13 March 2017 and by the time it reaches the Gold Coast for the start of the 21st Commonwealth Games on 4 April, it will have travelled for 388 days and covered 230,000 km through the entire Commonwealth nations. Let the Games begin!